It was an evening of sizzling style at the Radisson Water Garden Hotel with Nokia's fashion event. Attendees were greeted by cocktails and canapés at the foyer, where the latest Nokia models were on display. Kicking off with a few upbeat instrumentals by a jazz band - Jazzy Chopsticks - the event opened with a showcase by Aarong. The ethereal jamdani found a new place in contemporary fashion as Aarong continued their celebration of the traditional weave. 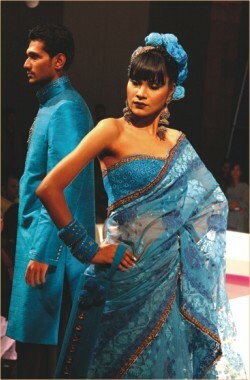 The designs featured saris and shalwar kameez ensembles that incorporated a current take on traditional jamdani motifs. The colour palette for the kameezes ranged from vibrant reds and soothing whites to jazzy black and sparkling shades of silver and grey, and emphasis was on creative cuts, on a garb that has defied time. Necklines plunged or leaped, from halter to off-shoulder to deep vees on princess-line bodices ending in flowing skirts, teamed with churidars. The saris stuck to the pink to purple end of the spectrum and focused entirely on the ornate jamdani motifs. The overall look was bold, and yet sophisticated. A brief musical interlude came in the form of Anila Choudhury, who sang chart favourites like Nupur and Gaibo na among other songs. Kuhu's collection had casual wear that teamed tie-dyed chiffon kaftans and tops with capris and dupattas to create the effect of a shalwar kameez set. The choreography also included an enactment of a couple flirting using their stylish Nokia phones, in order to underscore Nokia's commitment to style. The second musical interlude was filled in by Fahmida Nabi, who launched into a patriotic number, as well as some old favourites. The final collection was from Mayasir. Sizzling in sheer brilliance, the ensemble spoke for the effort that went in the very detail of the queue. The glitz of the attires, matched the accessories in a euphoric expression as models walked the ramp. There were three separate colour schemes: bright turquoise, black and green-gold. The men's attire saw a regal, Mughal influence. Elements from the British Raj were evident in the empire waists, the tasselled borders, shoulder wraps and other accessories. The make-up, which was done by Persona, switched from the soft, natural look to smouldering eyes and dark lips in the style of old-school movie stars. Mayasir's collection offered a lot of variety within a coherent theme, and was a great way to wrap up the show.